Instead Craig (Keir Gilchrist) is about to be committed to a psychiatric ward for having suicidal thoughts brought on by peer pressure, romantic worries and stressy parents. The funny thing about Story is that Ryan Fleck and Anna Boden would rather play this scenario for laughs than for drama. One Flew Over The Cuckoo’s Nest this isn’t, their adaptation of Ned Vizzini’s novel accentuating the positives that might result from being banged up for a week. It’s hard to believe the original was quite as pat as it’s rendered here. Yet despite the trite sentimentality, the film isn’t without a woozy, kooky charm. Gilchrist – combining elements of numerous John Hughes protagonists – is endearingly clueless as the gawky centre around which the action revolves. 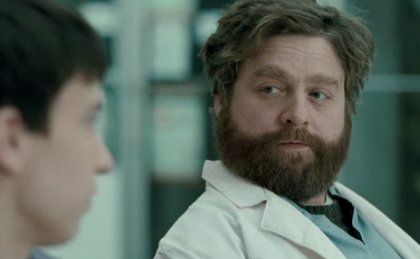 Galifianakis, meanwhile, gives inmate Bobby unexpected soul and pathos. OK, anyone with experience of mental health issues will laugh this out of town, not least during one dream sequence that has Craig sing a cover of Queen’s ‘Under Pressure’. They’ll know it takes more than five days to bring about the sort of lifeaffirming uplift Boden and Fleck dole out as casually as a beaker of meds. Wavering between affecting dramedy and goofy asylum- com, this is an enjoyable but superficial placebo that soft-soaps the realities of psychological disorder.